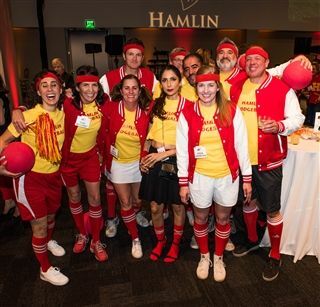 The Hamlin Parents Association holds fun-filled and inclusive community-building and major fundraising events during the school year. Generally held in late September/early October, the Hamlin Golf Classic takes place on a public course in San Francisco. There are opportunities to underwrite and sponsor the event, as well as to play and volunteer. All levels welcome! Annually held in early December, Winterfest is a wonderful community event that takes place on the Hamlin campus. From visiting authors, games for kids, and gingerbread house workshops, to a book fair, boutique vendor shopping, and cocktail reception, there is something for everyone! Several opportunities for volunteering exist with varying degrees of time commitment. Generally held off campus in March/April, the Spring Gala and Auction is the largest fundraiser coordinated by the Parents Association. In addition to the option to attend the Gala dinner and participate in the live and silent auctions, donors can underwrite the event or sponsor the attendance of a faculty/staff member.